Paul Pinkerton grew up in central Pennsylvania and in 1969 was drafted to serve in Vietnam. Like many combat vets, Paul returned home from the frontlines of the war bitter as a result of what he had seen and experienced. In particular, he was haunted by the images of dead children from the body counts he had conducted. Paul channeled his anger and disillusionment into POW/MIA activism after the war. When it became possible for Americans to return to Vietnam, he self-financed private efforts to locate the remains of American soldiers…and he succeeded. A few years ago, the families of five MIAs were able to have burials (of a dog tag, tooth, or bone fragment) as a direct result of Paul’s efforts. A very modest man, Paul has neither sought nor received any significant publicity for these activities. He’d rather talk about another topic that has consumed his time and energy over the past decade: helping Vietnamese children. 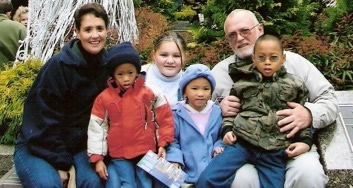 Along with his wife Sandy, Paul has adopted three children from Vietnam, two of whom Vietnamese doctors said wouldn’t survive. Today, all three are healthy, highly energetic, and happy. Paul is a devoted father, and describes his children as “his salvation.” And in addition to their commitment to their own children, Paul and Sandy have long been committed to helping needy children in Vietnam. During a trip to Vietnam in 2004, over bowls of pho and some cold 333s in a Saigon café, Paul, Sandy, and their tripmates made plans to establish, upon their return to the States, a formal charity to continue and expand on their work. But those plans went on the shelf when, within a week of his return to the U.S., Paul was diagnosed with malignant and aggressive prostate cancer-a condition almost certainly caused or accelerated by his exposure to Agent Orange during the Vietnam War. A little over two years later, with lots of support from Sandy, his family, and many friends, Paul has bravely and fiercely battled his cancer and his current health is generally good. Sandy has decided it’s time to return to the plans they tabled in 2004 and formally establish a charity to improve the well-being of kids in Vietnamese orphanages–with a particular emphasis on those who are less likely to be adopted.